A few weeks ago we were at the grocery store and I saw a large display of beautiful, bright colored plastic drinking straw. The straws were in bags of 250 and they were having a buy 3 for $5 deal. So of course I bought them, I mean who doesn't need 750 brightly colored plastic straws? When we got home I took some of the straws out and cut them into smaller pieces, while the girls made some plastic straw/play dough sculptures. Once I had cut up a bunch of straws I gave the Bee a long piece of yarn to string the pieces of straw onto. 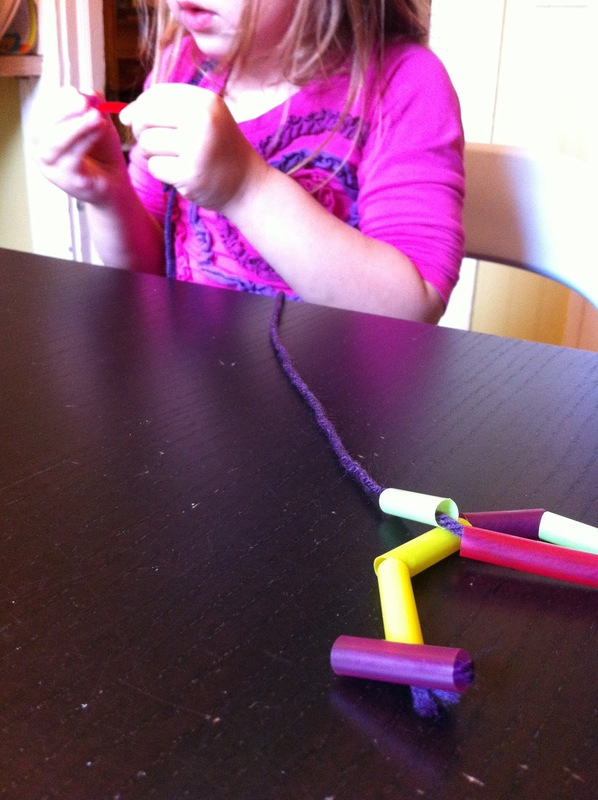 I tied one straw piece onto the end of the string so that the pieces wouldn't slip off as she got them on (you can see this in the picture below.) She had a little trouble getting the string through the straw so I took a piece of pipe cleaner and wrapped it around the end of the string. It made a perfect needle and with that she had no problem getting the plastic straw pieces on. She was very focused and before I knew it she had a very long line of plastic straws. I made a little loop on one end and we slipped the straw on the other end through the loop to turn her long strand into a beautiful necklace. This week I think we will work on a few more necklaces so we can give them to all our favorite mothers this Sunday for Mother Day! This is great! I've just made a note to myself to look out for drinking straws when I'm shopping. Thanks Vik! It really works well!